This entry was posted in Can't put Anywhere Else, Life in General, My Art & Writing and tagged art, confessions, crafts, creating, crime, dreams, family, friends, humor, jealousy, retro, school, shopping. Bookmark the permalink. Love the drawing! You sure got busted though, naughty gurl!! I love the smell of new crayons, too. 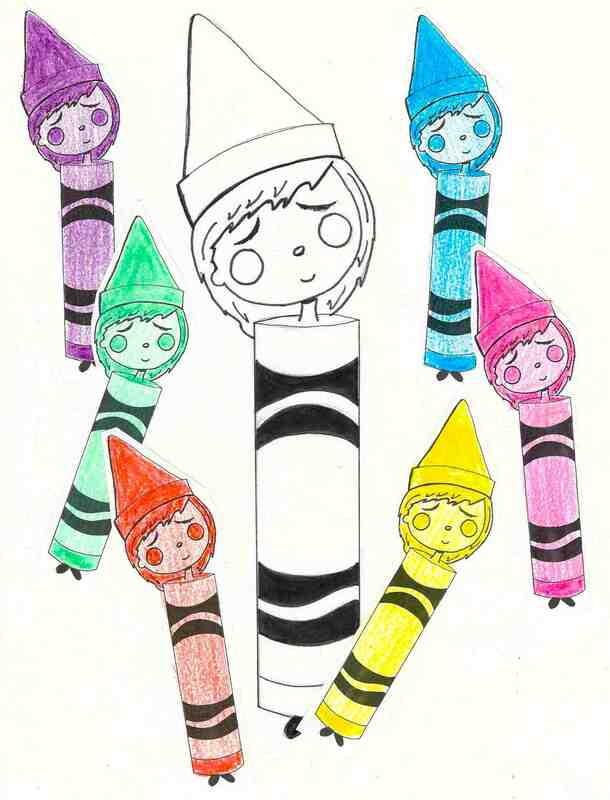 Okay, and somehow I kinda love that you decided to steal crayons of all things—a true artist. Here’s to smelling crayons in 2015! I’d love to hear the Sock Story! I can see a splendid graphic with it too (hint, hint). Yes, Catholic guilt is hardwired through the DNA strands early. It’s not a kiddie b’day cake unless is has at the minimum at least one sugary hue…! Oh, that reminds me of something I did in desperation in my youth. It was worse…it was a crime against a friend. <:-( I had forgotten about it until I read this post! LOL That story reminds me of the one heard throughout the South about bass boats. If you’ve got a 12 footer you dream of a 14 footer. If you’ve got a 14 footer you dream of a 16 footer. I could go on & on but you get the idea, we’re never really satisfied until we’ve got the biggest, baddest thing out there. Sadly, I find myself afflicted with that syndrome concerning cameras. Then I hear of my poor sister forced to go back to work at age 75 with a broken clothes dryer she can’t afford to fix. She’s hanging everything on a backyard clothes. 😦 Kinda puts things in perspective doesn’t it? Then there are those with so very little and you’re absolutely right, it does put and should keep things in perspective. Your sister has you though and that’s worth much. Terrific Tuesday and I hope your sister gets back on her feet soon. I’ll keep her in my thoughts. I do what I can with what I have. I gave away a carload of clothes before this past move to my new home. I’ve given away leather motorcycle clothing, sleeping bags to the homess and self inflating air mattresses. I’m paring my possessions down to what I need as I grow older. I’m really now going camping and sleeping on the ground anymore so I clean house. It goes to a worthy cause. Ah! The coveted box of 64. Not just with the sharpener, but with bronze, gold and silver crayons. A true crime of passion. Oh, yeah – I’d forgotten about the silver, gold and that magical bronze. Those were the coolest! I hope you broke in 2015 with cheese doodles! Oh nooo… Those years of longing for more colors turned you into such a passionate artiste! 😀 Lovely story! Of course 🙂 but i liked the crime too. Ha! !